Describing the sensory characteristics of wine is an inexact science. Rooted, as it is, in subjectivity, accurate descriptions detailing the taste and aroma components of a wine are dependent on the reader (you) sharing some common experiences with the writer (me). I’m often asked why wine writers feel compelled to go to such great lengths and use sometimes obtuse terms to describe the sensory aspects of wine. My stock answer is that wine has such multi-dimensional qualities that it is helpful to give readers as much information as possible. On the other hand, if I use non-traditional language to describe the wine, you may end up scratching your head and wondering what “precocious, assertive, or unctuous” have to do with the way a wine smells or tastes. 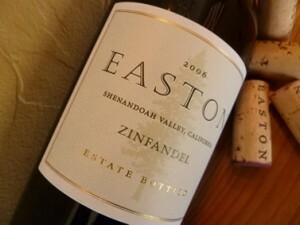 This all came to mind the other day as I was trying to describe the attributes of a particularly good red wine produced in California’s Sierra Foothills – the 2012 Easton Amador County Zinfandel. The stuff was so pleasing to me that I was having difficulty describing it without becoming overly exuberant. However, I think there is a difference between using what I will call traditional language to describe wine versus using non-traditional terms. For example, if I describe a chardonnay as having ripe green apple flavors, you will immediately use your own memory of the taste, smell and texture of ripe green apples to understand how the wine might actually taste. If I wanted to be more specific, I could say that particular chardonnay has the taste of ripe Granny Smith apples. Well, you get the point. In other words, the more specific the language used to describe how the wine looks, tastes and smells, the better you will be able to make a decision on whether it appeals to you. There are descriptors I try and steer clear of because, first and foremost, they sound like words an officious wine snob might use. And secondly, the terms don’t really provide any good information that can be used to evaluate whether or not I should purchase the wine. That’s not to say I haven’t ever succumbed to the temptation. The rationalization I once used to defend my description of an exceptionally good wine as being “orgasmic” was that most people have some sense of what that word means. Hey, I could have described the experience as having been “ethereal,” but then how many of us have a working knowledge of that transcendent term. The moral of the story here is that you can benefit from descriptions that are based on solid sensory experiences. In evaluating wine, I have experienced the taste of blackberries, cherries, vanilla, cinnamon, etc. And I have smelled toast, grass, butterscotch, mold, or Limburger cheese. But when you get right down to it and the adjectives are stripped away, wine is either good, okay, or unpleasant. So here are a few adjectives to describe in –hopefully- understandable language a couple of wines you might wish to try. From Languedoc in southern France, this ancient grape (picpoul) is grown along the Mediterranean Bay of Thau near the village of Pinet. A clean and refreshing white with fresh tropical fruit flavors, try this with plainly cooked seafood or as an aperitif with fruit and cheese. This zinfandel has chocolate and teaberry aromas with rich, blackberry and plum notes. It is full-bodied, yet balanced and is a serious mouthful of wine. Aged for 10 months in French oak barrels, this Zin begs to be matched with a pork roast rubbed with garlic and black pepper.